Several years ago I was flying to meet some friends for a girls trip in Chicago. When I booked my ticket, for some reason (and why do these things always happen to me?! ), it placed my name in the record as Darla Do Baerg (instead of Darla D. Baerg). I called the airline right away and they said it shouldn’t be a problem if I had my ID. I believed them right up until the time they took my ID at security and said it didn’t match my ticket. (Insert eye roll here). After a trip back to the ticket counter and talking to multiple people I was cleared to fly. My friend Missy still calls me Darla Do to this day. Another time I ordered at a restaurant and they kept calling “Delmay Deloney” over the loudspeaker. Since my name at the time was Darla Dillahunty I didn’t think it was my order. Over and over they said “Delmay”. “Delmay”. I finally went and asked and, sure enough … it was my order. This morning I was thinking about names as I read my Bible. 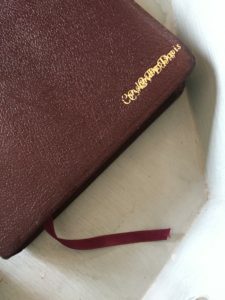 The last few years I have been noticing that the words in my Bible were becoming blurrier and smaller. I’m sure it has nothing to do with the fact that I’m getting older (ahem). I decided I needed a larger print Bible to use when I taught. I stopped by our church bookstore and looked at the “sample” large print Bible. Deciding it was perfect I asked if I could buy one. Unfortunately they no longer carried that particular one so I asked if I could buy the sample. I was told they couldn’t really sell it because the front cover was messed up. They had printed several names on the cover one on top of the another. I told them I didn’t mind the mess ups because God knows my name so it didn’t really matter what it said on the front. They laughed but y’all, I was totally serious. I love that it’s all messed up! It’s just like me, a big mess … but the message inside is perfect. People ask me about it when they see it and I love telling them the same thing. God does know my name. He knows who I am. In fact He knows each of us by name. He knows the number of hairs on our head. He knows all the days of our lives before they ever happen. That’s so cool. I love the “Cheers” TV show theme song that says … “sometimes you want to go where everybody knows your name”. And God’s word is certainly one of those places. The best place, in fact. He always knows us and in His word communicates peace, joy, comfort, hope … whatever we need. And it’s not just our name He knows, it’s our circumstances … our hurts, trials, joys … He knows it all. Our lives can be as jumbled and messy as the name on my Bible … but His word meets us in the mess and provides just what we need. I once read that our favorite word in the human language is our own name. Aren’t you so glad God knows yours?